The 2016 Toledo Jeep® Fest was an event that was the first of its kind for Toledoans. 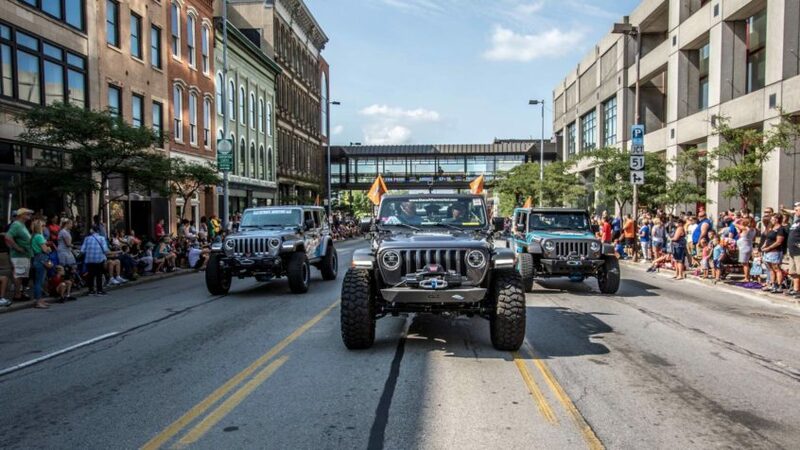 It brought Jeep enthusiasts from around the country to the city of Toledo to celebrate the 75th anniversary of the iconic Jeep Wrangler and drew crowds of 40,000 people. Though the event was a massive success, the Toledo Jeep Fest Steering Committee wanted to raise the bar for the next event, and they did. The 2018 Toledo Jeep Fest was a massive hit, drawing crowds of over 60,000 people. The downtown Toledo event brought together Jeep fans from over 27 states, Washinton DC, Canada and Mexico. Beginning on August 10th and ending August 12th, over 15,000 people attended the kick-off concert at ProMedica Park, more than 1,800 Jeeps lined the 20-block all-Jeep festival and show, and over 1,700 people participated in the for 4-Mile Run and 1-Mile Walk. As a result of the festivities downtown, Toledo experienced $4.5 million in economic activity during event weekend. A Jeep festival isn’t a real Jeep festival without vendors. The 2018 Toledo Jeep Fest introduced a new centrally-located Vendor Midway, which brought vendors a unique experience of setting up shop in the streets of downtown Toledo. The 2018 Toledo Jeep Fest hosted 100+ local and national vendors. $140,000 + in-kind donations totaled to over $300,000 raised for the event! The funding for the 2018 event saw a 200% increase in comparison to the 2016 event, which enabled the festival extend its programming over the whole weekend, as well as expand its footprint in the city. Toledo Jeep Fest trended nationally on Twitter during event weekend, was featured in 500+ news stories nationwide, and over 301 million people were reached via news media coverage! On behalf of the Toledo Jeep Fest Steering Committee, thank you to all our generous sponsors for supporting this event. We wouldn’t be able to do it without you. And thank you to all who attended the event! We hope that it was a great Toledo experience, and we hope to see you at the next one!